It's time to take out that second mortgage. Cause you're not going to want to miss out on this. One of the greatest musicians of all-time is ready to unleash a beast of a box set. And it's perhaps one of the coolest pieces of music memorabilia released in the last decade. Over 40 years in the making, The Weird One is finally ready to bestow the world with his entire life's work. And it's quite a glorious thing to behold. Yes, 'Weird Al' Yankovic is finally giving fans a career-spanning box set that includes every single one of his studio albums and a ton of cool extras. 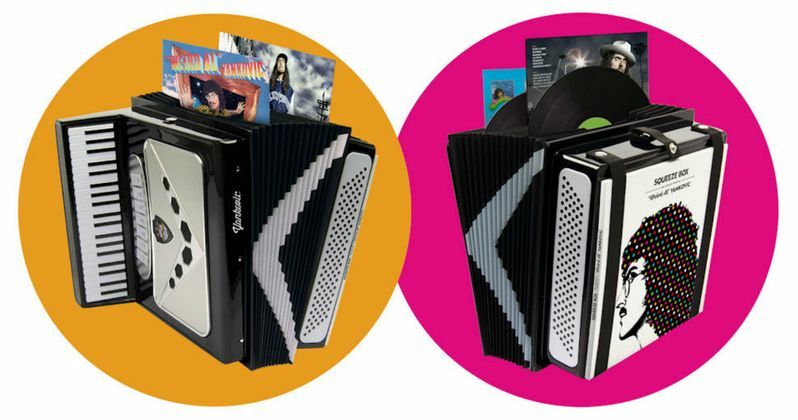 There are 14 vinyl albums included in this Accordion-Shaped collectible. And it is aptly titled 'Squeeze Box: The Complete Works of "Weird Al" Yankovic'. Any true fan doesn't need to be told that the accord is Al's instrument of choice. Legacy Recordings and PledgeMusic have teamed up with Yankovic for this massive set. And it is currently available for pre-order on PledgeMusic.com. The site is allowing pre-orders until February 28, with the set expected to arrive on November 24, 2017. Just in time for the holidays. This mammoth collection from the King of Parody includes all 14 studio albums plus a bonus album of demos and rarities remastered in 150-gram vinyl. 100-page Collector's Book of rare photos and memorabilia. Signed test pressing, one of the original 14 studio albums, your choice! All of above is housed in custom created replica of Al's signature accordion! You also get a Customized Zoetrope-animated turntable mat. Limited edition retro-style Weird Al pennant by Oxford Pennant. Custom Weird Al socks. Magnet sheet (8.5"x11") (build your own Al). And a commemorative Tee Shirt. Called the Platinum Vinyl Box Set Bundle, that baby is going for $475. There are a few cheaper options. But really, if you're going to go, it's probably best to go all the way. Legacy has this to say about the set. "Legacy Recordings, home to definitive releases by the world's foremost recording artists including Bob Dylan, Bruce Springsteen, Elvis Presley, Pink Floyd and Miles Davis, proudly presents Squeeze Box: The Complete Works of "Weird Al" Yankovic, a career-spanning box set of all fourteen of Al's studio albums, remastered for CD and 150-gram vinyl, and lavishly housed in an exact replica of the artist's signature accordion." There is also a Test Pressing set that goes for a whopping $1,500, but it is all sold out. There were only 27 sets of Test Pressings of all 14 original studio albums plus Medium Rarities, the album of demos and rarities. These were sold as a complete edition. Al will sign and number each set. And they will be packaged in their own box, with Collector's Book from the box set. The albums included in the set include the following. "Weird Al" Yankovic (1983), "Weird Al" Yankovic In 3-D (1984), Dare To Be Stupid (1985), Polka Party! (1986), Even Worse (1988), UHF - Original Motion Picture Soundtrack and Other Stuff (1989), Off The Deep End (1992), Alapalooza (1993), Bad Hair Day (1996), Running with Scissors (1999), Poodle Hat (2003), Straight Outta Lynwood (2006), Alpocalypse (2011), and the latest album Mandatory Fun (2014). If you visit the site, there's a fun video that shows off the set set to some of Al's classic tunes, which kicks off with Another One Rides the Bus, his parody of the Queen classic Another One Bites the Dust.